I want to take the opportunity to thank everyone for the support and shenanigans of 2016! Here’s hoping 2017 is just as much fun. 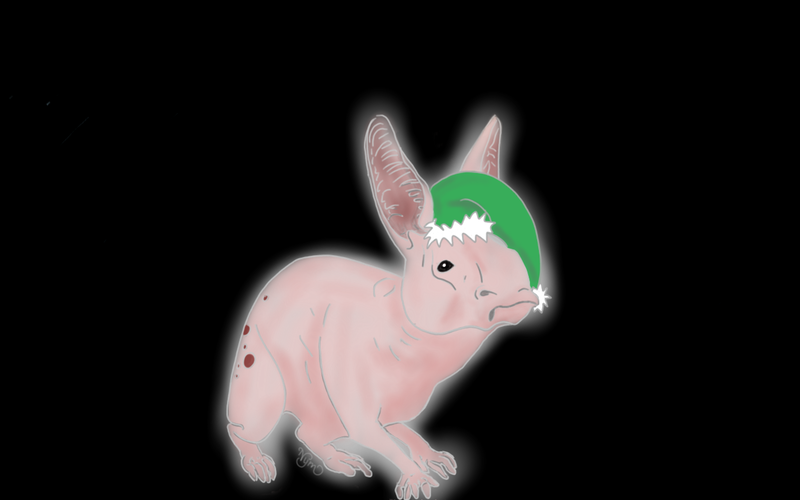 Have a festive nug – see you all in the new year! Back in January, Abi of Butthead and Pastry cosplay suggested a summer Dragon Age shoot at Warwick Castle and asked if anyone would be interested. I fired off my response with less than thirty seconds of consideration. At the time, I had Lavellan half finished and wasn’t sure whether my work would be anywhere near the quality of the more experienced cosplayers, but I was so eager to be part of it. Warden-Commander Mahariel was next on my list of “Must-do Cosplays” and my experiments were already underway, so once the date was set for August I had less than eight months to get her finished, alongside all my other projects. In retrospect, I could have done with dropping a few things so that Mahariel could be a little more polished but, life being what it is, I made do. I always pack more props than I’m likely to need, just in case, and The Gathering was definitely no exception! As well as my Antivan Fire grenade and Jar of Bees, I packed a few lyrium and health potions, my Warden’s codex , two plush nugs and a mabari. That was as close to “packing light” as I really get! I also found a gorgeous label for Aggregio Pavali (by taye_x on Reddit), which inspired us to make some more based on Inquisition’s Bottles on the Wall collection! From left to right: Golden Scythe 4:90 Black; West Hill Brandy; Butterbile 7:84; Aggregio Pavali; Dragon Piss. Eventually, we may actually get around to doing the rest of the collection. I tend to be an anxious person, especially in new situations. The Calling, held at Beverley Friary in June, was my first big non-MCM event. Aside from my husband and brother, who got dragged along, I had never met a single attendee before and not only survived living with everyone for a long weekend, I loved every minute of it. Although Warwick Castle is on a much grander scale than Beverley Friary (and utterly crammed with tourists! ), I felt much less intimidated by the idea of meeting so many new people than I had on the way to The Calling. It helped that I’d already met Abi and Jay, who organised the shoot, as well as a few others, at conventions earlier in the year but I was so worried about whether my costume would look terribly gauche compared with the fantastic work I’d seen the others posting on Facebook in the months before. On the morning of the shoot I realised that I’d neglected to pack the tiny invisible elastics I’d bought for Mahariel’s braids, so I ended up having to use a random hairband I found in my makeup bag to pull some of my hair back in an approximate style. Finally on the way to the castle! I won’t drag out a blow-by-blow account of the day, but I really want to say how fantastic the day was. All the cosplayers, roped-in partners, photographers and The 86th Floor, who did all our professional shots and filmography were amazing. It was a real pleasure to hang out with them all day and the cosplayers looked absolutely incredible. Even though I’d seen photos of a few of the costumes on Facebook beforehand, the detail and designs were so impressive. I’ll put a full list of all the cosplayers involved at the bottom of this post – please go check out their work and give them some love! The big surprise of the day was how much the tourists enjoyed us being there! We knew that the castle was going to be open to the public – we were all there on day tickets, after all, and I expected we would probably get some funny looks and possibly some derisive comments. Some thought we were employees of the castle, in all our fantasy regalia, and a lot of us were stopped regularly so that visitors and their kids could have photos taken with us. At one point, I was sitting in my wheelchair waiting with Ellie (our fabulous Zevran) for a turn in front of the camera and we had an almost constant stream of people come, one after another, to pose with us for the better part of about fifteen or twenty minutes. They were queuing. It was the most surreal thing I’ve experienced in cosplay, so far! Zevran and I at the end of a long day! Of course, with tiny cheese wheels to hand, I had to recreate the Wedge of Destiny at lunch! We didn’t manage to get as many photos as we would have liked, especially of the Inquisition crew (Warwick Castle itself is not very wheelchair friendly and a lot of their shoot was done indoors) and somehow completely failed to get any of Catbutt Cosplay’s fantastic Yavanna and Phil the Despair Demon. We did manage to get a few nice ‘behind the scenes’ pictures, though. Go and check out the professional photos at The Eighty-Sixth Floor Music and The Space In Between Photography! We couldn’t pass up the opportunity to get Alistair to pose with the ballista! I think this shot of Merrill might have to become another Kirkwall Office of Tourism postcard! Our thanks to Warwick Castle for letting us come and play on the site; Abi and Jay for organising everything; The Eighty-Sixth Floor Music for all their hard work; The WinnTeam and The Space In Between Photography for helping to capture the day; all the cosplayers and helpers for making the day so much fun. You’re all so amazingly talented and it was a real honour to be part of this project with you.